This self-assessment study aims to investigate Saudi teachers' knowledge about the three essential components of TPACK, technology, content, and pedagogy. A quantitative research design was employed. The sample included 111 males and 132 females; out of which, 116 were primary grade teachers, 55 were middle grade teachers, and 72 were secondary grade teachers. Around 32% of the teachers had teaching experience of between 10 and 20 years, and about 27% had teaching experience of between 5 and 10 years. A majority of the teachers reported that they had an average confidence level of knowledge relative to the TPACK framework. Certain differences existed amongst them on the basis of their gender, teaching subjects, and teaching experience. Statistically, a significant difference was shown between technological content knowledge and teaching experience. A recommendation resulting from the study was that the teachers ought to change their teaching style from traditional to effective learning approaches with the use of technology. Beyond this, the Ministry of Education ought to focus on providing both girls' and boys' schools with educational technologies, and teachers with effective technological training. The framework of Technological Pedagogical Content Knowledge (TPACK) is commonly used for understanding, learning, and describing different knowledge types needed by professors or teachers (Mishra & Koehler, 2006). Proper guidance is provided by the decision and policy makers while formulating the policy of an education system in order to develop and implement technologies in teaching and learning (Lee, 2002). However, technological advancements in education should not only be focused, but additionally, there is the need for more effective learning tools (Romeo, 2006). There is positive impact of Information and Communications Technology (ICT) on various learning processes (Romeo, 2006). The development of three overlapping components of learning including content, pedagogy and technology conceptualises the pedagogical approaches. Cox and Graham (2009) have argued that TPACK may help educators to understand the potential contributions of new technologies in education. According to Graham (2011), TPACK can be used to assess the way in which teachers' professional development affects their performance in the classroom with the use of ICT. The added value of TPACK can be found in the support it provides students through technology in their learning, and their development of conceptual, and procedural attributes (Voogt, Fisser, Pareja Roblin, Tondeur & Van Braak, 2013). Traditional learning methods need to be changed as per advanced learning approaches, with the use of ICT. Bransford, Brown and Cocking (2000) have argued general teaching skills to be required in order to revise with the use of advanced technologies for effective teaching. Lee (2002) meanwhile suggested that with the integration of ICT into schools, teachers ought to play the role of mentors, rather than expert in formation givers. This study investigates teachers' knowledge about three essential components of TPACK, which include technology, content, and pedagogy (Mishra & Koehler, 2006). The present study has contributed towards the understanding of the teacher's level of knowledge in Technology, Pedagogy, and Content in Saudi Arabia. This may also be helpful for other countries, where technology has not been effectively utilised by teachers. The study validates and reinforces the importance of technology in the teacher preparation stage, which is beneficial for other countries as well. The following research questions have been constructed to investigate teachers' knowledge with regard to three components of TPACK and their combination. The questions have been developed on the basis of seven domains, which include technology, pedagogy, content, technological content, technological pedagogy, and pedagogical content, along with the combination of all these components (TPACK). 1. What is the level of teachers' knowledge of technology, pedagogy, and content, including the combinations of these domains? 2. Is there a significant difference between participants' TPACK and their gender, teaching subjects, and teaching experiences? TK: general knowledge of standard and advanced technologies, such as blackboard, applications, software, smart devices, and social media. These cases require certain skills to operate particular technologies. PK: knowledge of teaching and instruction, such as instructional practices, pedagogical approaches, teaching strategies, students' roles, classroom management, and student communities. CK: knowledge of subject matter, such as scientific information and mathematic knowledge. TCK: knowledge of employing technologies to gain information about specific subject matter knowledge. TPK: knowledge of employing technologies to support teaching strategies and instructional practices. PCK: knowledge of transforming specific subject matter into a pedagogical approach for students. TPACK: knowledge of employing suitable technologies to represent specific subject matter knowledge via successful instructional approaches and teaching strategies. There are several previous studies that considered the relationship among TPACK framework domains. For example, a study conducted by Archambault and Crippen (2009) showed that although the teachers had positive attitude towards the domains of pedagogy, content, and pedagogical content, they were less confident about the use of technology. The framework of TPACK revealed some of the interconnected domains; technology and pedagogy, and technology and content are also related to one another. Within the TPACK framework, technological knowledge, content knowledge, and pedagogical knowledge play an important role (Chai, Koh & Tsai, 2010). It ought also to been examined that all the domains of TPACK are complicated and interconnected, and consequently, it proves difficult to separate each domain. Moreover, pedagogy, content, and technology proved to be the most evident, out of which technology was the most important domain (Harris & Hofer, 2011). Content, pedagogy, and technology are important constituents of the framework of TPACK; but for completion of this framework, it is important to design technology-mediated instructions for teachers. According to Kelly (2008), teachers ought to be regarded as instructional designers, rather than just teachers or instructors. The use of ICT in teaching and learning has several characteristics. These characteristics, when linked with the TPACK framework, can have positive impact on the outcomes; therefore, this practice ought to be implemented (Baran, Chuang & Thompson, 2011). Technological Pedagogical Content Knowledge (TPACK) was introduced by Mishra and Koehler (2006) as a conceptual framework for teacher knowledge specifically with regard to technology integration. TPACK is built on Shulman's (1986) study of PCK, with the addition of technological knowledge by Mishra and Koehler (2006), to explain effective teaching with the use of technology. Although, TPACK was mentioned by Mishra and Koehler (2006), this idea is not new, as several researchers have addressed a similar concept while describing the associations between technology, content, and pedagogy. The term TPCK referring to technology-enhanced PCK has been utilised by Niess (2005). A TPACK framework has gained popularity over the last 10 years (Voogt et al., 2013) as a result of effective integration of technologies into education (Koehler, Shin & Mishra, 2012; Mishra & Koehler, 2006). The use of TPACK can assist researchers and educators in integrating technologies into teaching and learning. TPACK has mainly described instructors' needs of knowledge to integrate appropriate technologies into effective teaching (Schmidt, 2009). In other words, TPACK has been suggested as the combination of content, pedagogy, and technology. TPACK provides a combination of knowledge of a particular subject that is taught using technology and the knowledge of teaching strategies (Niess, 2005). Koehler et al. (2012) suggested that this framework joins technology to specific pedagogical methods and curriculum content. The theoretical framework of TPACK has been represented as a Venn diagramme with the overlapping circles that represent the seven basic domains by Mishra and Koehler (2006), as shown in Figure 1. There are several scales that have been developed by researchers for examining the TPACK self-efficacy of teachers (Chang, Jang & Chen, 2015; Koehler et al., 2012). Koehler et al. (2012) have categorised TPACK into five types, namely self-report measures, open-ended questionnaires, performance assessments, interviews, and observations. The items of the surveys were different according to the nature of studies, where Schmidt (2009) developed a scale with 7 aspects and 47 items. Similarly, Sahin (2011) adopted a TPACK scale with seven dimensions and 47 items for measuring TPACK of the student teachers. TPACK is used to develop the concept of TPACK, explore strategies, teacher beliefs, and measuring teachers' TPACK (Voogt & Roblin, 2012). Most of the TPACK surveys aimed to measure and preserve the professional teachers' TPACK, and some of them were conducted to measure university faculty member's TPACK (Chang et al., 2015). Several surveys have been validated through exploratory or confirmatory factor analyses (Archambault & Barnett, 2010; Schmidt, 2009). This self-assessment study aimed to analyse teachers' TPACK, and to examine the way in which it differs on the basis of gender, teaching subjects, and teaching experiences. The study recruited teachers from primary, middle, and secondary grades from the Kharj District, which is located 85 kilometres south of Riyadh. The sample teachers were randomly selected. Teachers who were interested were sent an informed consent form by emails to be signed before the starting of survey. The emails of teachers were provided to the researcher by Kharj Education Directorate. A total of 243 responses were obtained, among which 132 were females and 111 were males. Table 1 provides some teacher participants' characteristics. In this study, a quantitative research design has been employed to analyse the results. The respondents in this study were allowed to complete the survey in their own chosen place at a time that was convenient to them, via self-administered survey (Robson, 2002). The first part of the survey was concerned with the collection of demographic information such as participants' gender, school grades, subject courses taught by teachers, and their teaching experience. This aspect was useful to understand the background of all the respondents that facilitated in testing different variables. The second part of questionnaire was based on TPACK as a guiding framework that enhanced the level of knowledge among the teachers. It included 40 questions that were based on the literature (Mishra & Koehler, 2006; Shulman, 1986). The seven domains including technological knowledge (TK) (7 items), pedagogical knowledge (PK) (6 items), content knowledge (CK) (6 items), technological pedagogical knowledge (TPK) (6 items), pedagogical content knowledge (PCK) (5 items), technological content knowledge (TCK) (5 items), the knowledge of technology, pedagogy, and content (TPACK) (5 items); distributed into 40 items. There are several TPACK surveys that have been validated through exploratory or confirmatory factor analyses, and this study tends to increase the validity (Archambault & Barnett, 2010; Roberts, 1999; Schmidt, 2009). The use of a pilot approach in this study has examined some suggestions to revise the items. The Validity Internal Consistency In order to examine validity of the internal consistency, the Pearson correlation coefficient between each statement and each domain was conducted. The Pearson correlation coefficient ranged between .725 and .925 for the correlation among each domain, and ranged from .652 to .931 between statements. All these coefficients were statistically significant at level <.01. Cronbach' s Alpha (Cronbach, 1951) was used to examine the reliability coefficient that measures the reliability of a set of items in a study. The results showed that Cronbach's alpha of the seven domains ranged from .868 for the CK domain to .921 for the PCK domain. According to Field (2009), the value of Cronbach's Alpha at an acceptable level of reliability was either seven or higher. The results have been developed on the basis of teachers' TPACK knowledge. Different statements have been provided to the participants about all of the domains, and participants were asked to select whatever statement best suited them. First Question: What is the Level of Teachers' Knowledge of Technology, Pedagogy, and Content, Including the Combinations of These Domains? To examine the level of teachers' knowledge of technology, pedagogy, and content (TPACK), and sup-TPACK, mean and standard deviation were conducted for domains. This is provided in Table 2. The confidence level of each domain from the participants' perspectives was separately determined in other tables. Teachers thought about the confidence level of their TPACK, which was generally medium (M = 3.65 & SD = 0.76). The confidence level of teachers' knowledge with regards to items in each domain were determined using mean and standard deviation as follows. The first domain included seven items that were shown in Table 3, which has determined the confidence level of teachers' technological knowledge (TK) from the participants' perspectives. The majority of teachers described themselves on average (overall M = 3.15 & SD =1.04), positively for all the items of technological knowledge (TK). All the items were indicated to have high ratings, from 24 to 61 percent. The second domain included six items that has been shown in Table 4, determining the confidence level of teachers' pedagogical knowledge (PK) from the participants' perspectives. The confidence level of teachers' pedagogical knowledge (PK) from the participants' perspectives was high (M = 4.13 & SD = 0.76). Moreover, about 68% of participant teachers indicated that they have an ability to apply a variety of teaching methods, problem-solving approach, active learning, discovery learning, and project-based learning (M = 4.00 & SD = 1.03). Another domain of the TPACK framework is the confidence level of teachers' content knowledge (CK), which included six items as shown in Table 5. Teachers described themselves on average (M = 3.75 & SD = 0.79), positively on most of the items. Least positive, however, only 30% of teachers thought high or very high knew conferences and events in the field of their subject speciality with mean of 2.95 and standard deviation of 1.16. Another domain of the TPACK framework included six items, as shown in Table 6, indicating the confidence level of teachers' technological pedagogical knowledge (TPK) from the participants' perspectives. Teachers' responses indicated that the confidence level of their technological pedagogical knowledge was high on average (M = 3.68 & SD = 0.97). About 67% of teachers thought that they could confidently choose the appropriate new technologies to motivate their students to learn. However, only 48% of teachers thought that they possessed the ability to effectively manage classrooms supported by smart classrooms. Another domain included five items showing the confidence level of teachers' pedagogical content knowledge (TCK) from the participants' perspectives (see Table 7). The confidence level of their pedagogical content knowledge was high on average (M = 4.03 & SD = 0.88). Teachers (about 76%) indicated that they have knowledge about appropriate teaching approaches in their speciality (M = 4.14 & SD = 0.98) and have the ability to prepare effective activities in their speciality (M = 4.10 & SD = 1.0). The sixth domain included five items, which are shown in Table 8, determining the confidence level of teachers' technological content knowledge (TCK) from the participants' perspectives. The majority of teachers described themselves on average (M = 3.73 & SD = 0.97) positively when it came to their confidence level of TCK. The last domain included five items that are shown in Table 9, determining the confidence level of teachers' TPACK from the participants' perspectives. According to teachers' responses, the confidence level of their technological pedagogical content knowledge (TPACK) was high on average (M = 3.16 & SD = 1.02). Teachers' ratings on their ability to integrate effective teaching methods with appropriate modern technologies in their speciality were highest (62%), with the mean of 3.75 and the standard deviation of 1.14. In summary, a majority of teachers were described to be average in most of the domains concerned in this study such as CK, TK, TCK, TPK, and TPACK. However, they described themselves on high in two domains, Pedagogical Content Knowledge (PCK), and Pedagogical Knowledge (PK). Second Question: Is There a Significant Difference Between Participants' TPACK and Their Gender, Teaching Subjects (Differences Between Subjects), and Teaching Experiences? Further discussion of the results is associated with the seven domains that indicated the confidence level of teachers' TPACK based on their gender, teaching subject, and teaching experience. A comparison between mean scores (M) and standard deviations (SD) was performed to examine the differences between male and female teacher knowledge. Statistically significant differences between male and female in some domains of TPACK including TK, and TCK were obtained through the t-test analysis. The t-values reached -3.85, and -3.14 respectively, with p-values of < 0.01. There is no statistical significant difference between male and female teachers in response to the domains of PK, CK and PCK. In order to examine the differences between eight subjects, viz. including Islamic studies, Arabic Language, Sciences, English Language, Mathematics, Social Studies, Computer, and Other, a One Way ANOVA (Analysis of Variance) was performed. This helped in determining whether any of the differences between the means are statistically significant. According to ANOVA outcomes, the domain of TK (Technological Knowledge) was significantly different, according to teaching subjects at level p-values of < 0.01. Another domain (TPACK) was also significantly different according to teaching subjects at level p-values of < 0.05. Other than these, no significant results appeared among the other domains based on teaching experience. As shown in Table 10, Post hoc comparisons using Fisher's Least Significant Difference (LSD test) was utilised to examine which pairs of the group means differed. According to Abdi and Williams (2010), this approach helps in calculating the smallest significant difference between two means. The significant differences between the teachers' TPACK domains were examined on the basis of their teaching experiences using one way ANOVA (see Table 11). Teachers' TK was significantly different among teachers, with various levels of teaching experiences at level p-values of < 0.01. Moreover, there were significant differences in teachers' PK and TPACK according to teaching experience at level p-values of < 0.05. However, Fisher's LSD was also used to examine which pairs of the group means differed as shown in Table 12. Statistically significant differences were obtained between the teaching experiences of 20 years and above (M = 2.67) and less than 20 years (p-values of < 0.01). Moreover, statistically significant differences were also observed in the TPACK domain between teachers with 20 years or more experience, and five years to less than 20 years of teaching experience. The TPACK framework has helped in understanding the overall teaching performance of the participant teachers. The confidence level of teachers' TPACK in general was medium, specifically, the domains that related to technology. The study aimed to investigate the teachers' knowledge about the three essential components, which include technology, content, and pedagogy. The technological Pedagogical and Content Knowledge of teachers was not high. It was perceived that only a few (32%) of the teachers were involved in using social media to create effective teaching techniques, whereas only (22%) comprehended that they use blackboard to teach their students. 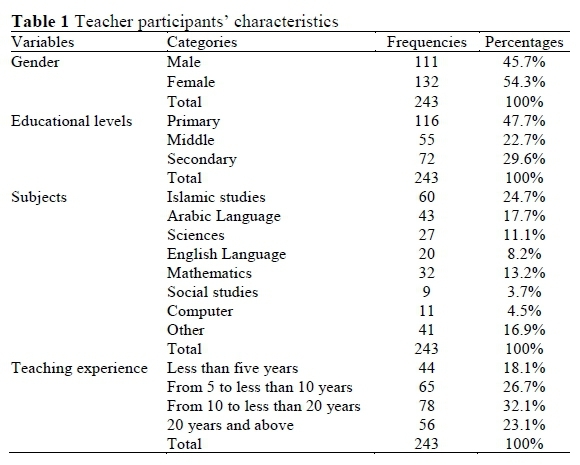 Lack of Saudi teachers' training in the use of new technologies in education (Bingimlas, 2010) is identified as a common reason for such findings, along with the resistance of changes in teaching methods (Gomes, 2005), or lack of time to prepare their lessons using technology (Sicilia, 2005). Taking into account teachers' pedagogical knowledge, the confidence level of teachers was high. A majority of the participant teachers were quite confident regarding their ability to connect with students, and the lowest responses were gathered on arranging group activities and discussions for students. Sixty-eight percent of the teachers were comfortable with the usage of various teaching methods, such as project-based learning, cooperative learning, active learning, and discovery learning. Moreover, teachers' pedagogical content knowledge was estimated as high as great number of teachers (76%) affirmed of having proper knowledge of teaching methods and plan effective activities accordingly. This occurs due to Saudi teachers, who have been prepared well by their preparation courses at Saudi collages of education. Also, it may suggest that they have built good experiences in the classroom, as most of the teachers had good experience for more than five years (see Table 1). Such findings are consistent with Archambault and Crippen's (2009) findings that teachers' knowledge levels were high for items related to pedagogical knowledge, and pedagogical content knowledge. Learning interactions can be supported, when training is provided to teachers in a constructivist environment. Appropriate strategies are also used to train the technical staff regarding the practices of TPACK framework. A study conducted by Kav-anoz, Yüksel and Ozcan (2015) revealed that the level of general self-efficacy among participants regarding TPACK is associated with their attitudes towards web-based instructions. The ability of teachers in assimilating technology into their teaching methods holds great importance. The level of technological literacy between teachers and their ability is majorly relied upon the improvement of teacher performance within TPACK framework. It is worth noting that a difference between male and female teachers' knowledge was observed only with the domains related to technologies. The interpretation may be similar to that of all the girls study separately from boys in the Saudi schools. However, both the genders are provided with similar policy, courses and curriculum (Doumato, 2003). The school supplies including educational technologies may be different between girls' schools and boys' schools (Bingimlas, 2010). Another study conducted by Alshehri (2012) demonstrated that there is a negative association between evaluation and effectiveness of professional teaching preparedness in university courses. The interaction of learning can be supported, when trainings are provided. The creation and distribution aspects and utilizing innovative knowledge identify technological innovation that drives growth on the basis of expanded productivity. There were certain differences found among teachers according to their teaching subjects and their teaching experiences. On the other hand, there were notable differences between teachers who had 20 years of experience and above, and those who had less than 20 years of experience. Such findings occur due to a change in resistance (Gomes, 2005), as most of the old Saudi teachers followed older, more traditional methods of teaching (Bingimlas, 2010). The association between three components of knowledge, including technology, pedagogy and content has been introduced on the basis of TPACK framework. This helps to understand the association among three different components involved in effective teaching and learning with educational technologies. There were differences among teachers' according to their gender, teaching subjects and teaching experiences. Findings have important implications for Saudi teachers and educators. Specifically, preparation for the future teachers needs to be moved from traditional approaches to advanced approaches, including the integration of technologies throughout content courses (Arch-ambault & Crippen, 2009; Bingimlas, 2010). Moreover, the Saudi Ministry of Education needs to focus on providing both girls' and boys' schools with educational technologies and teachers with effective technological training, especially those who teach the subjects of Arabic language, Islamic Studies and Science.